The automotive industry requires stationary that represents the ideal business principles that the industry upholds. It should tell clients that your business is trustworthy and technologically advanced. Our 20 PT Ultra thick clear PVC plastic stock has a sturdy, thick feel, which makes the reliability of your business tangible. The transparent stock also lends its self to tell your clients how transparent your business operates which helps foster the image of a business that can be trusted. Our Top Glass takes advantage of this stock and combines white ink with UV printing to create a modern, impressive look. This template is especially appropriate for windshield repair since it uses a shattered glass background to create aesthetic interest and balance the black design on the left side of the card. In any industry, it is important to demonstrate that your business is not only relevant, but is on the cutting edge of the industry. You must showcase that your business is not only unique, but that it is professional and reliable. What better way to demonstrate these qualities to potential clients than by using our elite Ultra Thick PVC plastic cardstock? At 20PT thick, this sturdy stock unabashedly portrays confidence. Our Ultra Thick PVC stock is available in two unique finishings: Translucent Gloss, and Frosted Matte. 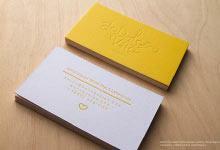 The translucent gloss finish provides a semi-cloudy sheen to the surface of the business cards. This glaze like finish is near-translucent and can provide a shine to your design. The Frosted matte finish provides a unique semi-opaque look that emulates the look of frosted glass. To make your design unique, we offer a variety of finishings on this stock! Foil stamp is available in a variety of colors as is metallic ink. Try printing full bleed metallic ink on this stock to create a light weight metal card imitation! Spot UV (spot gloss) can be used to create a glossy accent and UV printing can be added to print details and colors onto the design. White ink is also available if you would like to add an accent of white. These credit card sized business cards are ready in 12-16 business days and are the perfect statement piece to add to your stationary and branding. Order yours online today!